Small businesses are benefiting more than ever from advances in low-cost technology, including mobile solutions, POS systems and timesaving and labor apps. But franchising has been slow to adapt--disappointingly so, as it's one of the business models that stands to gain the most from cloud computing and other digital solutions. Tariq Farid is an exception. A die-hard tech geek, he started Wallingford, Conn.-based Edible Arrangements in 1999 with technology at its core. But he says he doesn't find many kindred spirits in the franchise world. "Saying that many franchise systems are stuck in the '90s is being kind," he says. "I think franchising is an amazing model, but technology is not in the comfort zone of a lot of franchise leaders. They don't understand that the point of technology is to make life easy so franchisees can focus on growing their business, not running their business." 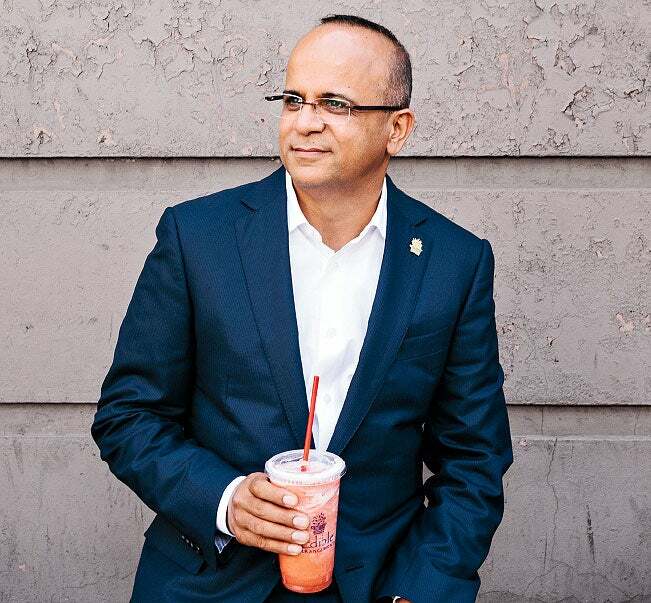 A thirst for innovation: Tariq Farid of Edible Arrangements. Navid Safabakhsh agrees that some franchises have a difficult time turning the ship when it comes to new technology. The co-founder and CEO of San Francisco-based Empowerkit, a service that creates and manages websites for franchisors and franchisees, says that while many national brands have adopted his system, convincing the franchise community to try something new is challenging because of the often lengthy vetting process for vendors. Additionally, he says, decades-long contracts mean that some vendors may be delivering systems that are years out of date. "Many franchise brands have paralysis when it comes to technology," Safabakhsh says. "They think, If I don't do anything, I'll be safe." That don't-rock-the-boat strategy is no longer acceptable. Innovations like fleet-management apps, improved customer loyalty programs and even digital signboards are already transforming the franchise world. And the operational streamlining provided by cloud-based tools and new restaurant technologies, as well as efficiencies in training and back-end operations like customer retention and billing, are creating two classes of franchise systems: those that are getting a bump from tech adoption, and those that will soon feel the pain from waiting too long. "The growth of cloud computing has transformed the franchise world," says small-business technology expert Ramon Ray. "Existing franchises don't have to be newer to keep up, but they have to stop being slower." Grease-pencil manufacturers were shaking in their boots earlier this year when Pittsburgh-based NoWait released its consumer-facing app. Since 2010, the NoWait system has helped restaurants manage their waiting lists, replacing pagers--which, at $50 each, can be expensive when diners walk away with them (this happens more often than you'd think). Traditionally, hosts and hostesses estimate wait times for customers, adding an extra 15 or 20 minutes to make sure they don't disappoint. Long waits and crowded entry areas mean customers might simply walk away and go elsewhere. But NoWait, which allows the staff to coordinate and give customers accurate wait times and text them when their table is ready, frees up patrons to head to the bar or take a walk before dinner. The app also lets diners put their name on the waiting list from a mobile phone, so they can show up exactly when their table is ready--a valuable timesaver for busy professionals and parents of small children. NoWait CEO Ware Sykes says the app--which he claims is used to seat more than 5 million people per month--has been embraced by Buffalo Wild Wings, Chili's, First Watch and other chains. He claims it has helped restaurants see at least a 15 percent bump in sales, because they can efficiently move more customers in and out the door. In fact, Sykes says, franchisees are leading the way in embracing the easy-to-implement system. "We've had franchisees adopt our system faster than franchisors," he says. "A lot of them are able to make decisions at a store level. That's how we got involved with Texas Roadhouse. They saw franchisees using the tech at their restaurants. It doesn't have to integrate with legacy systems; it's just replacing pen and paper. After folks see how much smoother their seating is and the increase in sales, it really is something that is adopted quickly." Innovations in POS systems--traditionally among the most complicated and expensive investments for franchisees--are also gaining traction. The full-function POS app Lavu has been adopted by small franchises and regional chains, according to Ben Harrison, vice president of creative and marketing at the Albuquerque-based company, but deals with bigger players are in the works. "Now that we've cut our teeth, we can take a leap forward into big enterprises," he says. "We're excited to move forward with franchises and chains." The advantage of a cloud-based POS system is the ability to generate finely detailed data, as well as cost savings. Harrison notes that because updates are free, users can save 50 to 75 percent on customization and service. The system also recently rolled out a new suite of reporting tools. "Franchises are really looking for granular information," says Lavu vice president of product development Alex Gibbs. "Some of them have a ketchup gun where they can dial in the amount to tenths of an ounce. Knowing that type of thing is important to them." At the corporate level, he adds, "franchises are going to want to be able to drill down into sales information for regions and individual locations. I absolutely think people are moving toward these kinds of real-time tech solutions." Harrison points out that the app-based system makes it easy to integrate new features that would require huge upgrades for traditional POS systems. For example, Lavu is already equipped to allow customers to place orders and pay through mobile devices, without handing over a credit card. When Jim Cavale, partner and COO at Iron Tribe Fitness, a 30-unit gym based in Birmingham, Ala., was ready to open a new location in 2011, he and his team made a point of reexamining their technology. Why? They were tired of jumping between five or six incompatible programs. "All of our systems were in silos," he says. "Our billing program was in a silo. Our support desk was its own program. Our collaboration system was [in a] silo. We had to input new data for each one, and they couldn't communicate with each other. We asked, How can we get all this information and have it in one system we own and control?" The solution was a custom-built application program interface (API) hub that integrates all of those programs. Now Iron Tribe can track potential customers from first contact to when they enroll, how much and how often they work out, how they're billed and how many extra services and products they buy--all on one system. Iron Tribe has also developed apps for clients that allow them to schedule training appointments and buy supplements and meals. "Building something like this is not as expensive as you might think," explains Cavale, whose API was created by a team of developers he met at one of his gyms. Moreover, he says, it's going to be unavoidable. "Franchisors have to realize, whether they want to or not, that they're soon going to be at the mercy of generation Y and Z on their work force. They speak a different language and use a different set of mediums. They are not going to work for a company that doesn't make them more efficient." Farid at Edible Arrangements agrees. He points out that since most people communicate and essentially manage their lives through their mobile devices, it makes sense to run their businesses from them, too. His tech company, Netsolace, which he founded before Edible, has kept the franchise as forward-looking as possible, developing mobile apps such as FranSupport Mobile, which lets Edible communicate and deliver training modules to franchisees; Franview, which lets field managers audit stores with the home office and franchisees in real time; and Pulse, a real-time communications system that lets franchisees and corporate stay in touch. Netsolace is also promoting Nextstep, which broadcasts training tips, best practices, efficiencies and company news. "When I was a kid and worked at McDonald's, they'd sit you down in front of a TV and play a tape showing you how to make the food," Farid notes. "Now we do that in real time. Before, we used to laminate training cards, and by the time we sent them they were out of date and cost $25,000 to $30,000. Now we can update our videos or slides instantly, so it's fresh. When a new employee goes through our training modules, they're completely up to date." Not all leaps in franchise-related technology are digital. One of the biggest developments has been the launch of a closed system for handling cooking oil by Mendota Heights, Minn.-based Restaurant Technologies Inc. (RTI). Since the advent of the commercial fryer, employees have had to strain oil, dump it into barrels and pour it into special rendering tanks behind the restaurant. Then the owner had to pay a special collector to come and pick up the stuff. Handling oil is a dirty, unpleasant job, so often it isn't filtered enough or changed frequently, which affects the taste of food. The RTI system has a holding tank that pumps fresh oil into the fryer, filters it several times per day, then pumps the used oil into a second holding tank that is emptied periodically by an RTI employee. The waste oil is recycled into biodiesel. The company, which has its system in some 21,000 restaurants, including approximately 10,000 McDonald's locations, added monitoring capabilities so it can tell when a customer is low on oil. It can also monitor oil filtration and will alert an owner if filtering is being skipped or handled incorrectly. Also reshaping franchise kitchens are the latest models of the TurboChef ventless oven, which can cook a fresh pizza in three minutes. Installing the oven means franchisees don't need to pay for expensive hoods (or the even more expensive hood maintenance), and the new models take up a fraction of the kitchen space. Rapid-cook ovens have been around since the 1990s but had been viewed as novelties. Now they are quickly invading the mainstream. In fact, one of the fastest-growing franchise sectors, fast-casual pizza, is based on the capabilities of these new ovens. "Pizza was never seen as a lunchtime option," says Dave Shave, vice president of global sales and marketing at Carrollton, Texas-based TurboChef Technologies. "It was a destination item where people had to sit down and wait 15 or 20 minutes. But the ability to bake fresh pizza quickly has opened up a whole new daypart for pizza." In fact, Shave says, TurboChef technology is what makes the concept for Pizza Inn's fast-casual brand Pie Five possible. Other franchises, including Schlotzsky's and Jason's Deli, are using the ovens, and Shave says even high-end restaurants are installing ventless rapid-cook ovens, which can roast, broil, toast and steam foods, as part of their basic kitchen equipment. TurboChef is also introducing a rapid-cook oven that replicates wood-fired pizza. All of that, Shave says, is reshaping the way franchises set up their kitchens, enabling them to have lower startup costs, smaller footprints and faster service. These are just a few of the innovations already transforming the franchise world. The big question that will be answered in the next few years is who will adopt them first, and who will use them best.